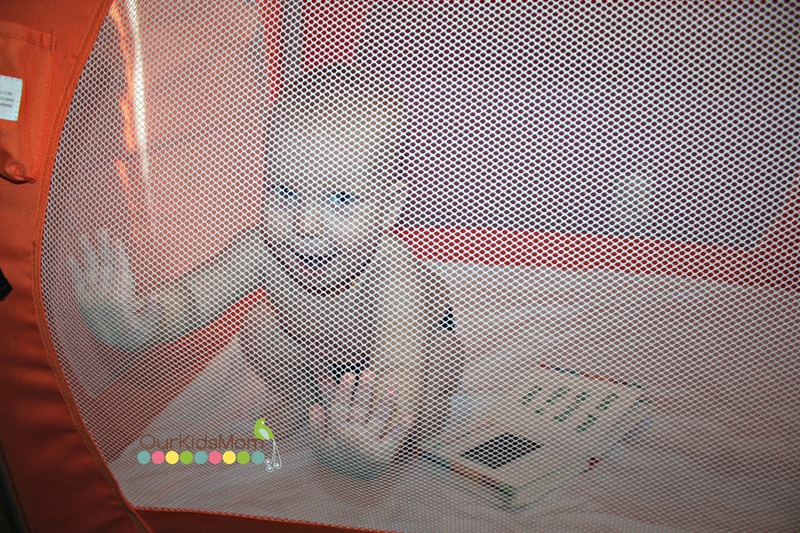 I was sent a Joovy Room Playard to try out with my youngest son. We were looking for a multi-functional item that didn’t have an overly large footprint to help make my everyday life just a little easier. Pulling the Joovy Room Playard out of the box, the first thing that I noticed was it has weight to it. Weighing in at 34 pounds, it is a substantially well made yard. Even though it’s a bit heavy, it’s not a problem to move the playard from room to room. There are 2 wheels at the end so you can lift one end and easily wheel it around to wherever you may need it. Initially setting up the Joovy Room did take me a little more time to set up then other playards because of all of the fabulous add ons to attach and secure to the playard. The playard itself is full size, giving your child lots of space for playing or for sleeping. What makes Joovy so different then other playard companies is their construction. Joovy uses 600D nylon fabric making it super strong, durable and stain resistant. I love that you can bring your baby home from the hospital and have a playard that can be used from birth to toddler. The bassinet holds a infant up to 15 pounds. Once converted to a regular playard, the sleep mat from the bassinet doubles as a floor in the playard. I love that Joovy included a heavy duty and super soft 100% cotton sheet. This was a welcomed surprise, as I usually never get around to purchasing a playard sheet. Instead I’m always looking for a blanket or something to wrap around to give my baby something soft to lay on. Once again Joovy thinks of those little things. After I put the fitted sheet on the sleep mat I pulled all the velcro tabs through the designated holes in the sheet, nice and easy. Now trying to get all the tabs through the holes in the bottom floor of the playard was a different story. To be honest I struggled with this part, especially getting the velcro through in the corners. I can honestly say I did break a sweat struggling to do this part. Once all the tabs were finally through and secured underneath the playard the floor mat is very secure. 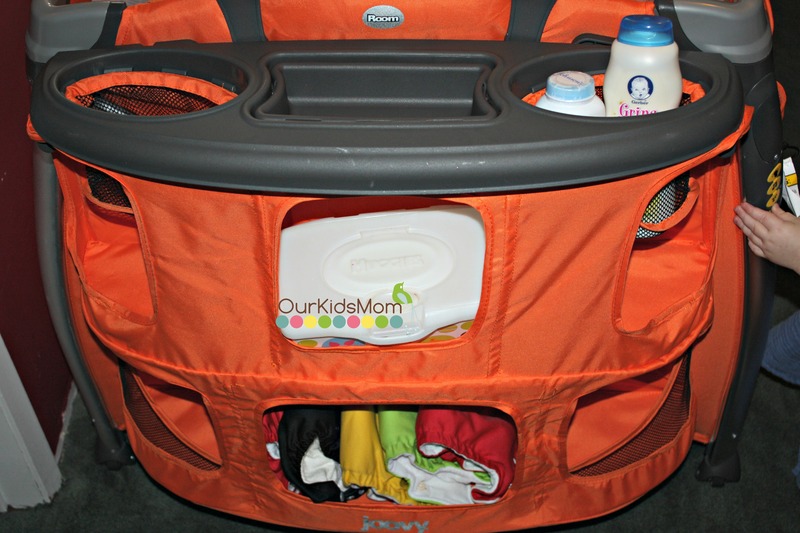 A great feature that is built into the Joovy Room is the removable changing table. The changing table is rated for babies up to 25 pounds. As always, safety comes first. Thankfully there is a safety strap to buckle your baby up to ensure he/she doesn’t roll off the table. When finished, simply wipe the vinyl surface down and you are ready for your next change. Another feature I love that I didn’t have with other playards is the easy stow away of the changing table. When you are finished using the changing table it simply un-clips and you can flip it over the edge where it hangs at the end of the playard until you need it again. Moving to the other end of the Joovy Room you will find a parent organizer like no other out there. This is the biggest parent organizer I’ve ever seen. There are 9 great sized storage compartments for storing everything you might want on hand. The parent organizer will hold up to 9 pounds of nursery items, that is a lot of stuff. 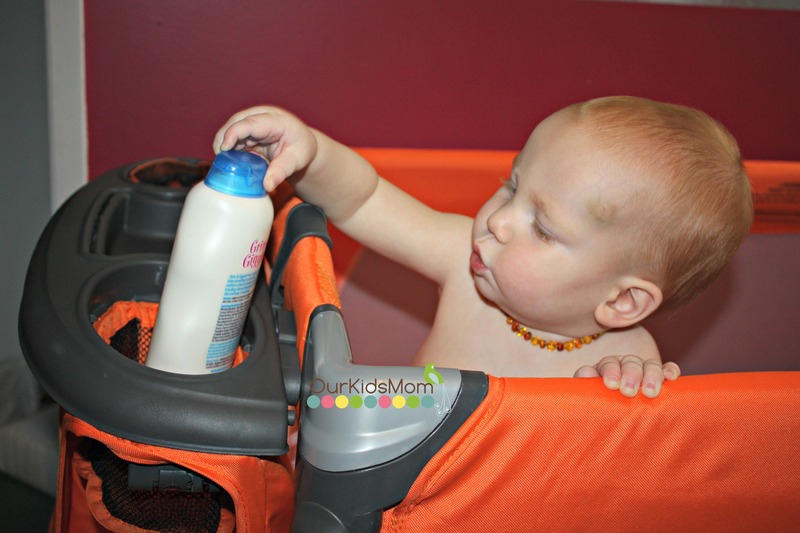 Since my son is older I can’t leave anything in the top of the organizer because he likes to reach in and he can access any lotions or items I may have sitting on the top. For older guys like him you can use the top compartments for smaller toys. It makes it a fun game! 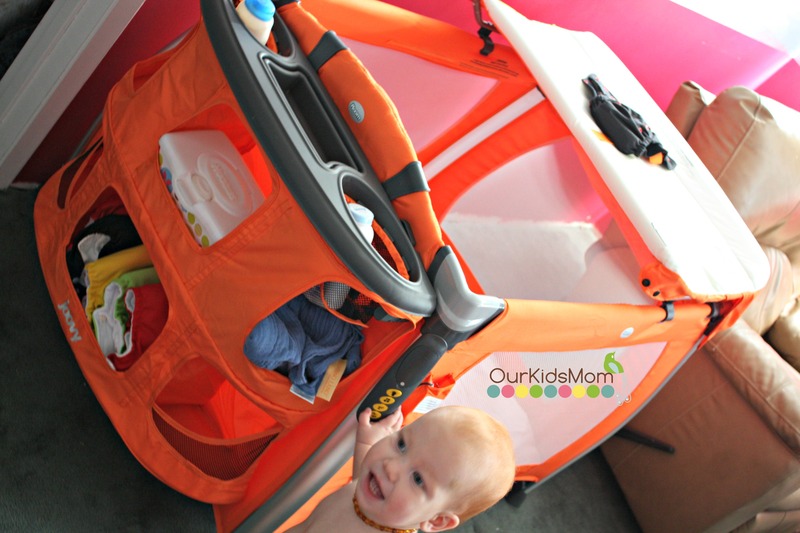 Joovy has included two unique features in their Room playard. 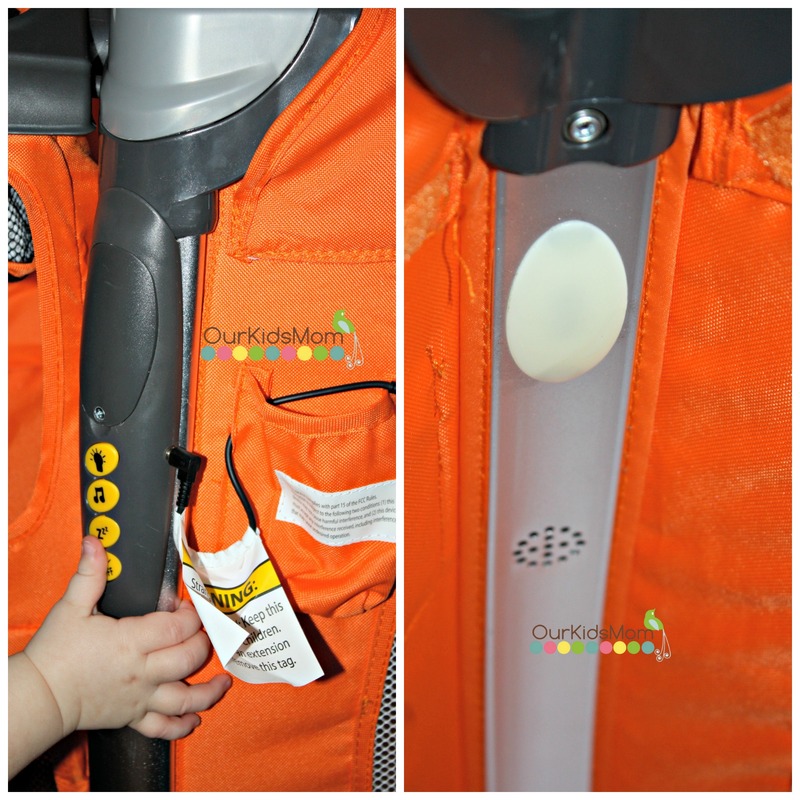 The first is a built in nightlight that is set to work inside the bassinet or playard. I personally love the nightlight, it’s just soft enough that it doesn’t interfere with my sons sleeping, but yet gives off enough light that I can check in on him in the middle of the night without disturbing him with a bright light. 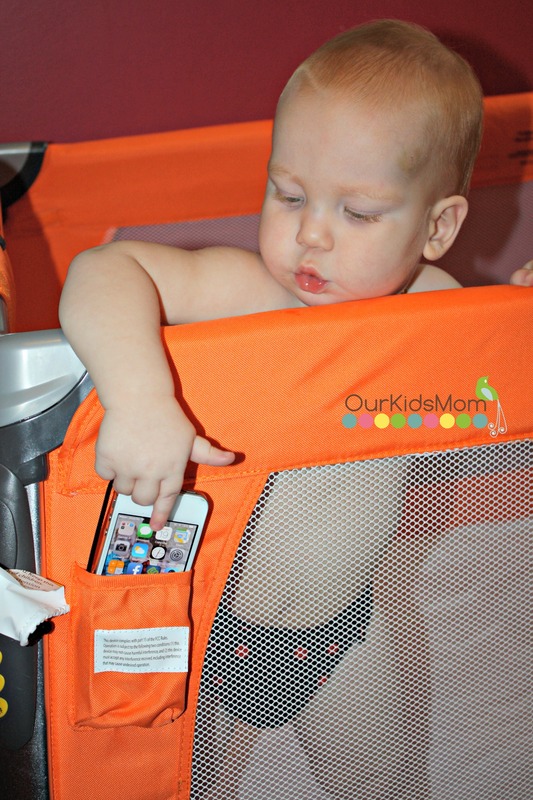 The second unique feature is the built in MP3 jack with a speaker on the inside of the playard. This allows you to play your own personal music for your child, or you can select one of the built in tunes for your child to enjoy. The music modes have a sleep mode so you don’t have to worry about getting up and turning it off once your child is asleep. I do wish there was a volume control for the music. I thought that the music was a little on the loud side for my guy trying to go to sleep. It took me a little bit to figure out, but the volume control is actually through your phone. I love the MP3 feature and was happy to hear this! The lullabye sound, on the other hand does not have a volume adjuster on it as of yet. I also found that the pocket that holds my mp3 player is reachable by my son. Although he loves this, it would be nice to see the pocket a little lower so baby hands can’t reach it. 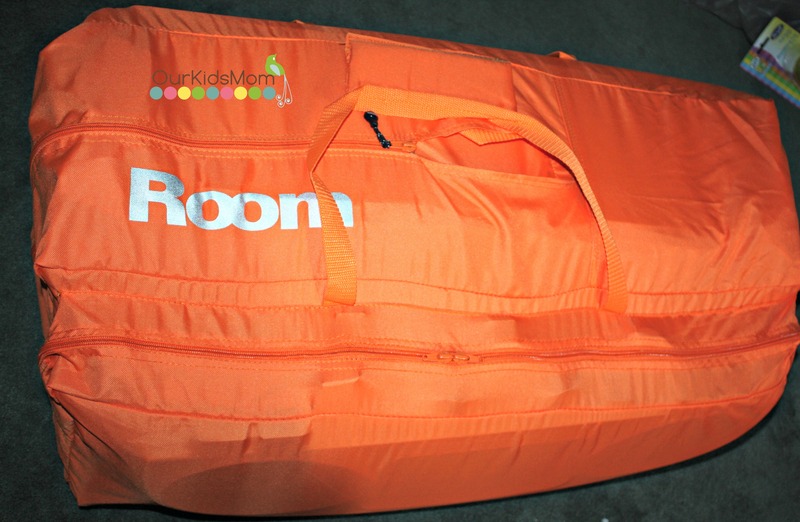 The Joovy Room comes with a zippered travel bag for making on the go easier. 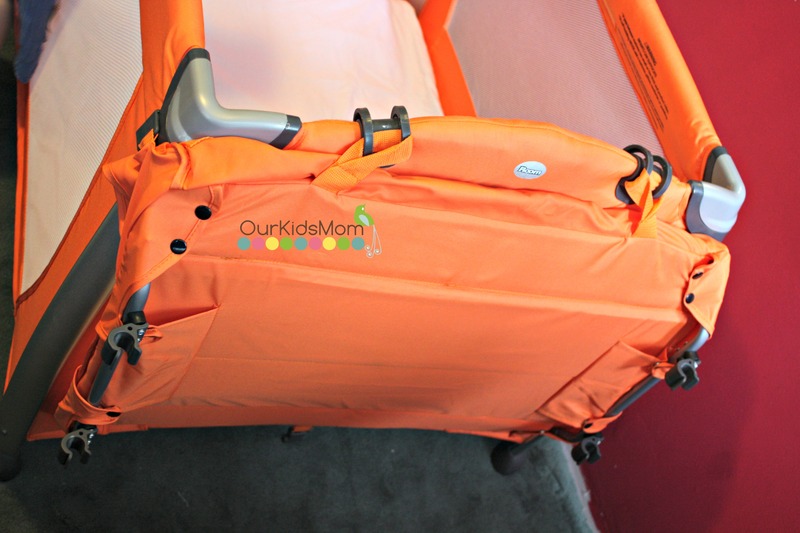 On the side of the travel bag is a zippered pouch that holds your parent organizer and the changing mat. I was able to fold up the bassinet in with the playard along with the fitted sheet. Once I got everything in the travel bag it was a nice snug fit. My only wish with the travel bag would be a couple of wheels on the bottom of the bag so I could wheel it rather then having to carry it. The Joovy Room is the most original playard I have seen on the market so far. From stylish looks, durability, and convenience to functionality, the Joovy Room will have you wanting to know more the moment you lay eyes on it. Overall I have loved the Joovy Room. It is very functional, very convenient , and super practical. I think Joovy has done very well designing a playard that will meet all your babies sleep, play, and changing needs in one product. The Joovy Room is more then just a playard, it’s a functional part of my house. Head over to www.Joovy.com and check out the great color choices that the Joovy Room Playard comes in. But seriously, this is a great play yard! Lindsey! 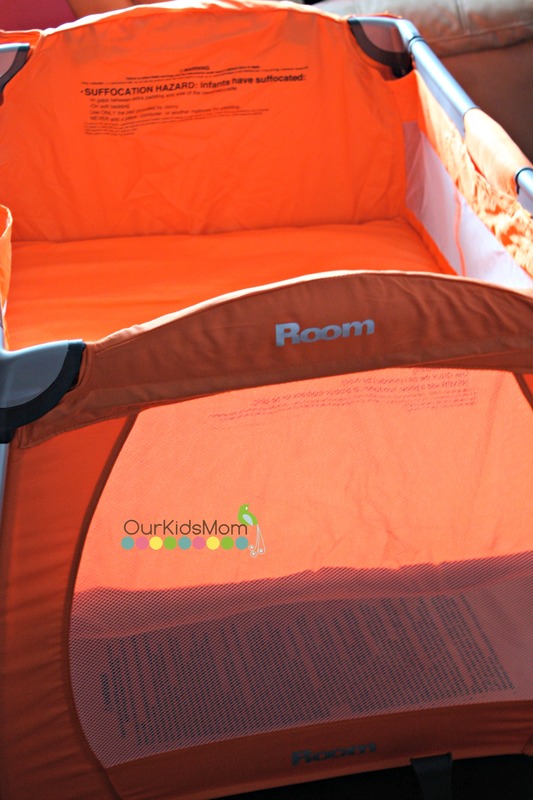 Thank you for sharing your comments and review of the Joovy Room! Great insight and discussion of features. I would like to share with you that the volume control is actually on your device (iPhone or MP3 player.) Try that and hope you find this helps! Joovy just makes such amazing products! I wish I had gotten this when my toddler was a baby, it would have surely helped me with space. We got one from another brand that while it was ok, took up a LOT of room. Wow this is really nice. I love the side storage organizer and that it has a light. The color of this is nice! What a wonderful playard. I would love to have it for my new grand baby to be. We are big fans of the Joovy brand and it looks like the Room is another great addition. I just love how functional it is!